The link between work/life stress and junk food is lined with buffets, fast food and carryout. The first step to help encourage mindful eating is for the person to determine if hunger is coming from their stomach or their mind. People whose hunger and eating patterns are linked to their emotions can still use food to feel better while eating the right foods. Identify one’s feelings that are triggers to eat and learning new coping skills is step one. Step two, is identifying which foods can affect and improve your mindset when faced with uncomfortable feelings. A healthy eating plan may be one of the first things to fall by the wayside in times of stress, but there are alternatives to emotional eating that lead to empowering food choices. Recognize and stop emotional and stress eating. Many of us turn to food the way others turn to alcohol or other substances. Using food is not a healthy coping skill, but a tempting trap to numb oneself by masking issues and delaying the feelings we need to address for emotional well-being. Identify the triggers – eating carbs and fats may lead to momentary comfort, but it inevitably makes the problem worse. When cravings occur take a moment to pause and reflect for the opportunity to make a different choice. Did the urge to eat come on suddenly? Is the craving for specific comfort foods and nothing else? Are you anxious, exhausted, depressed, bored or lonely? Committing to practice, paying attention to your eating choices and pausing between triggers and actions lead to empowering food choices. Learn to accept your feelings – dealing with emotions head on, means allowing oneself to feel, uncomfortable emotions. Don’t feed anxiety, release it through physical activity, squeezing a stress ball, playing music or deep breathing. Boredom binges can be avoided by reading a good book, taking a walk or turning to a hobby or activity that brings joy. Eating alone won’t fill the void of loneliness, but calling a friend, family member or playing with a pet can stimulate feel-good feelings, without the guilt. Identify higher-quality, whole foods to fuel your mind. The same foods that are good for the heart and body are good for the mind. Limit sugary and high-fat processed foods. Sugar is at the root of inflammation which affects the brain. Be happier with B-vitamins and folate. Evidence has mounted that B12 and folate may ward off depression and link to balanced brain chemistry and good mood. Include healthy fats. Omega-3 fatty acids have been shown to possess antidepressant and protective powers against cell damage or impairment. Food is digested into nutrients that impact every function of our body and mind. Eating a well-balanced, healthy diet can boosts mental and physical energy. 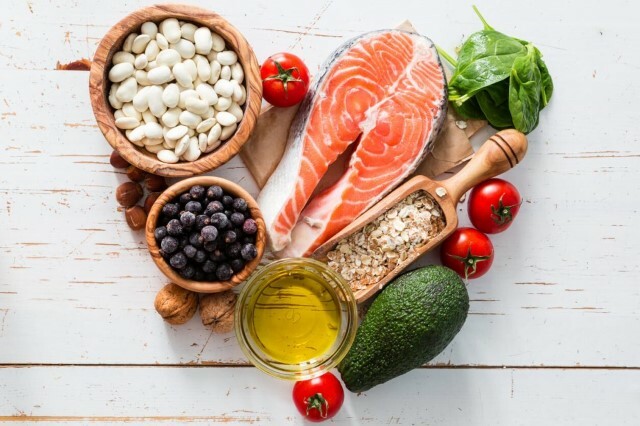 The catch 22, or problem is that, while people are suffering from anxiety, depression or vitamin deficiency, they are less able to or motivated to improve their eating habits without assistance. Awareness is one step, but a combination of counseling with a wellness coach or dietician can help form a “go-to” healthier eating plan. These efforts lead to a combination of better food choices and feeling better overall.